Supro - Minimalist AJAX Magento 2 Theme is a clean & minimal AJAX Magento 2 Theme suitable for online stores. With standard UI/UX design and magnificent focus on products, Supro will make your online store look more impressive and attractive to viewers and, as a result, help increase your purchase conversion rate quickly. Moreover, it is designated to serve a lot more eCommerce websites such as fashion store, furniture store, decoration store, etc. 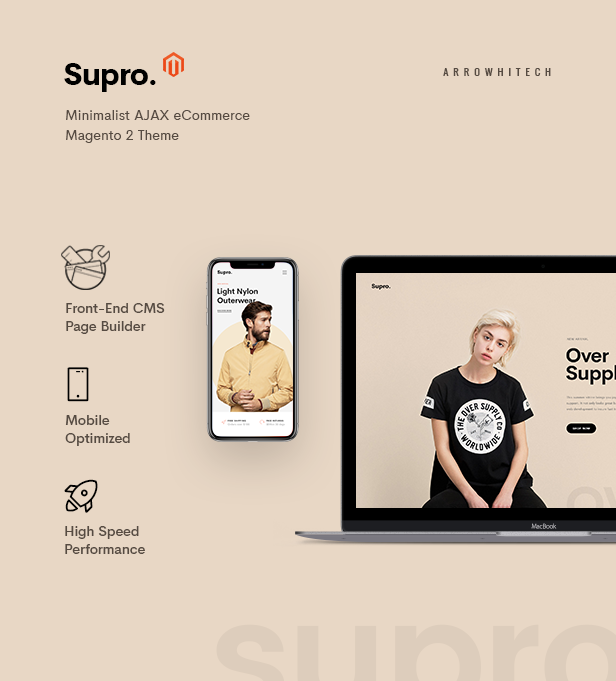 Supro is built on the default Magento theme combined with Front-end CMS Page Builder with 36+ block elements and MGS Theme Settings, making it highly compatible with third party extensions. Furthermore, The Supro theme package is bundled with MageSolution’s extensions such as Ajax Quickview, Ajax Layered Navigation, Ajax Fly Cart, Guest Wishlist, Instant Search, Lookbook, Mega Menu, Store Locator, and GDPR…, which saves you more than $799 in total. Thus, the power Supro brings you to transform your dream shop into a magic digital outcome is limitless. Let Supro flourish your business and reach your full potential today! You May Also Want To Buy!!! !